The teahouse at Lake Barrine may be 80 years old but the Devonshire teas it serves are as fresh and inviting as the crisp Atherton Tablelands air around this charming landmark. The teahouse juts out over the clean, clear waters of Lake Barrine, which sits right in the middle of tropical rainforest and is protected within the Crater Lakes National Park. 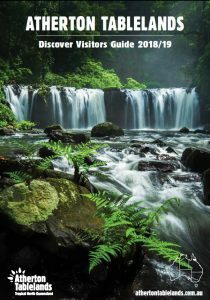 It’s a welcome stop on any Atherton Tablelands tour and one of the most beautiful places to have a cuppa or light lunch anywhere in Australia. And for lovers of a good Devonshire Tea, Lake Barrine offers one of the most memorable; where else could you get locally grown tea AND coffee, scones made to a fourth-generation secret recipe and topped with cream and jam produced in the neighbourhood as well. Visitors can sit back on the balcony and enjoy the scenery or be entertained with a lake cruise of the volcanic crater brim. Lake Barrine was formed when water filled the crater left by a volcanic eruption about 15,000 years ago. The lake is 730 m above sea level, about one kilometre in diameter, has a shoreline of almost 4.5 km, which can be walked and an average depth of 65m. The 45-minute guided boat tour circumnavigates the lake, getting its passengers up close and personal with the history, geology and wildlife of the lake. But Lake Barrine is more than just a pretty spot – it has been looked after for nearly 100 years by one family – the Currys. With a lease granted in perpetuity in the 1920s for the teahouse site, four generations have kept the area pristine in this captivating part of the Atherton Tablelands. The teahouse itself has had a series of incarnations – dance hall, aquatic centre, guest house, school, convalescent home – but is now a unique facility for those who want to walk, swim, cruise or just drink in the amazing serenity and beauty of Lake Barrine. Lake Barrine is off the Gillies Range Road, about 10kms from Yungaburra.